The Model TGF utilizes flexible tunnel that can be installed quickly around attic obstructions, making it the easiest tubular product to install in the industry. The low profile flashing creates an integrated look with the roof line - great for southern exposures. The standard Model TGF SUN TUNNEL skylight is designed for low profile roofing materials such as shingles and shakes. Tile flashing is also available for the 21" unit. 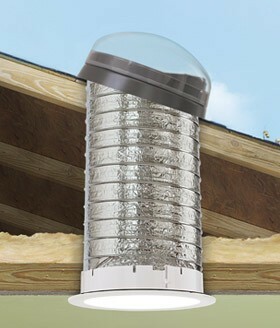 The TGF VELUX SUN TUNNEL skylight comes in 14" and 21" diameters. For more details on the available sizes, please call us at 1-800-900-0759. Domes are available in standard acrylic or high-impact polycarbonate for hurricane prone areas. This video explores the installation process for flexible SUN TUNNEL skylights. If you are interested in a specific installation step, you can select from the scenes listed.